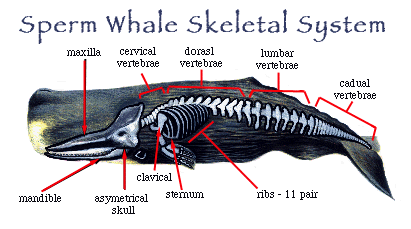 The skull of the sperm whale is asymmetrical and compressed, having been deformed by evolution more than the skull of any other mammal. The upper jaw is flattened, wide and long to hold the spermaceti organ. The first cervical vertebra of the neck is free, but the other six cervical vertebrae are fused as a single unit. The eleven pairs of ribs form a chest cage (together with the sternum) that is considered the strongest of all whales, capable of withstanding the great pressures of the sperm whale's deep dives. Teeth are found externally in the lower jaw (a total of between 30 and 60) and fit into sockets in the upper jaw when the mouth is closed. Teeth (about 10 to 16) found in upper jaw as whale matures at about 10 years. Females have fewer, smaller teeth than do males. The number of finger bones, or phalanges, in the whale's "hand" has increased over evolutionary time as front limbs became transformed into more efficient flippers. The radius and ulna of whales are fused at the (elbow to the humerus), providing a strong, yet immobile joint, for increased efficiency and stability. The spermaceti may possibly be used by the sperm whale in controlling buoyancy during dives: increasing the density of the wax to sink (by cooling it with water brought in through the blowhole) or decreasing the density of the wax to rise to the surface (by forcing water out of its nasal passages and allowing body heat to expand the wax). The spermaceti organ may also play a role in focusing sounds produced by the whale during echolocation, by changing the shape of the organ to control how narrow or wide the beam of sound emitted will become.